Samsung had a pretty solid idea last year to finally put a good version of Android into a proper digital camera. The one trouble with the idea was that the camera had a pricetag of $499, which is about $300-375 more than you'd pay for a similar digital camera that didn't have Android built in. Part of that cost looks to be dropped with a new WiFi-only model of the Samsung Galaxy Camera. Even though a 16MP digital camera with a 21x optical zoom would run you between $125 and $200, Samsung charged the premium for packing the Galaxy Camera with a quad-core 1.4Ghz processor, a 4.8" display, Android 4.1 Jelly Bean, and a radio for AT&T's HSPA+ network. Well, this new model, the EK-GC110, will have identical specs, but will not have the 3G radio, opting for WiFi only. No word on when the WiFi-only Galaxy Camera will be released, or the pricing, but we're hoping to find out more at MWC next week. Good Guy Samsung - Waiting for the Galaxy S4 to come out? Here's a camera. I honestly think Samsung lost it with this concept... just make a camera attachment. 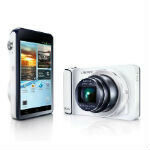 How much you wanna bet this camera is going to be similar quality of the galaxy s4. Why? Because the camera didn't sell well woohoo!! !